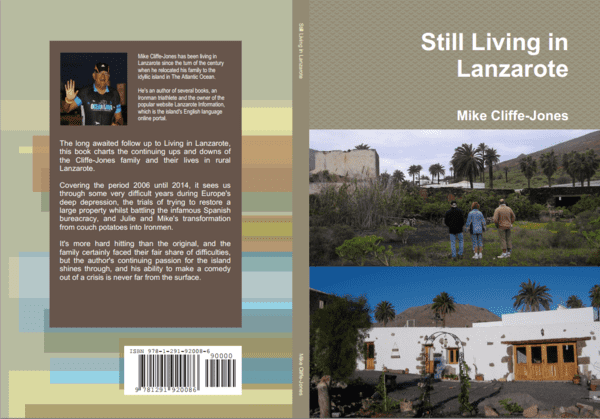 You may have read Mike’s first book, Living in Lanzarote. It told the story of how we came to move to the island, how we managed in our early years adjusting to the lifestyle and how we set up our business Estupendo. For the last year or so, he’s been busy working on the follow up – Still Living in Lanzarote. The new book covers the period from 2006 until the present day, and so many things have changed since then! We’ve been through some very difficult times, emotionally and financially, and we suffered very badly through the early part of the recession. But it will also show you how we came out of that period, set up the new business that you know as Lanzarote Information, and also changed our lives by aiming to complete Ironman Lanzarote. Uniquely, we’ve created a Facebook page for the book, and filled it with photos that relate to each of the 29 chapters you’ll read. It means you can follow the story in pictures as well as words. You can order the book right now as a paperback, or as an E Book to read on your Kindle, tablet or computer. If you haven’t already read Living in Lanzarote, Mike’s also put together a specially priced “electronic bundle” which will get you both books.